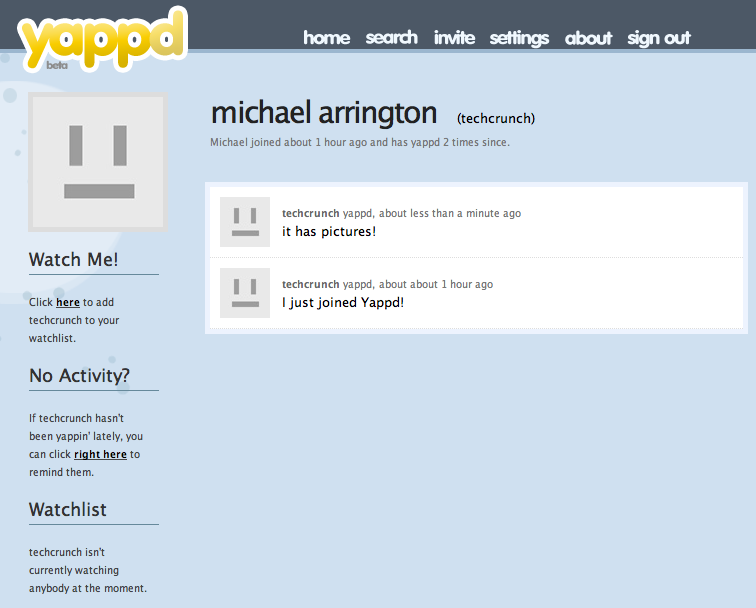 Yappd Launches, Calls Itself "Twitter With Pictures"
Here’s a me-too service that won’t last long. Yappd, a Twitter clone, launched today. In their email to us they describe themselves as “Twitter with picture messaging,” and that pretty much sums it up. It is a service that allows you to quickly tell the world what you are up to. You can add content via their website, email or sms. So while we debate whether Kevin Rose’s Pownce, another recent entrant to this space, is different enough from Twitter to become successful, yet another hopeful young gun enters the space with little to differentiate itself except the addition of a photo to your status messages. Unless Yappd has a brilliant marketing strategy up their sleeve, I don’t expect them to get much traction. I do like the photo feature, though. Hopefully Twitter will add it soon. My Yappd account is here. Don’t even think about adding me.